Bore Size / Thickness (in. ): 90mm / .040" 90mm / 0.050" 90mm / 0.060" 90mm / 0.070" 90mm / 0.080" 90mm / 0.089" 90mm / 0.098" 90mm / 0.120" 90mm / 0.140" 91mm / 0.060" 91mm / 0.080" 92mm / 0.030" 92mm / 0.060" 92mm / 0.070" 93mm / 0.027" 93mm / 0.030" 93mm 0.045" 93mm / 0.070" 94mm / 0.098" 95mm / 0.070"
Our M10 4 Multi Layered Steel Head Gasket is designed to withstand much higher combustion pressures than the factory head gasket and other conventional/aftermarket head gaskets. 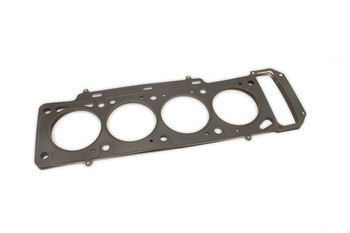 Made to the finest specifications and run all around the world on the street and in various motorsports; our MLS gaskets are made from a minimum of 5 layers of which the outer layers are coated with a patented type of material to ensure proper sealing of fluids. This design ensures a complete combustion chamber seal and elimination of failure due to weak factory gaskets blowing out under boost or high performance use. These gaskets are available on a variety of thickness' from as thin as .024" up to .140". We use these on every performance engine we build. From Kuben of Tønsberg, Norway on 11/22/2016 .